Road to Rescue salutes North Carolina’s Angela’s Angels. [Angela Townsend:] Angela’s Angels started when my family and I moved to our current home. The land our home was built on had many feral cats (and I am sure many drop-offs). We started off by adopting a few of the cats ourselves, having all of the cats fixed and vetted, and re-homing the ones we were able to re-home. We soon realized the problem was much bigger than we had thought and we decided to do something about it; thus Angela’s Angels Cat Rescue was started. The purpose of Angela’s Angels Cat Rescue is to rescue cats and kittens that are facing euthanasia, as well as those that are homeless, abandoned, neglected, and unwanted. We get these cats and kittens any needed medical attention, have them spayed and neutered, and place them in foster homes until we are able to find them a purr-ever home. We hope to reduce the amount of stray felines through promoting spaying and neutering. educating people on the importance of spaying and neutering, and holding low cost spay/neuter clinics for our county and the surrounding counties. 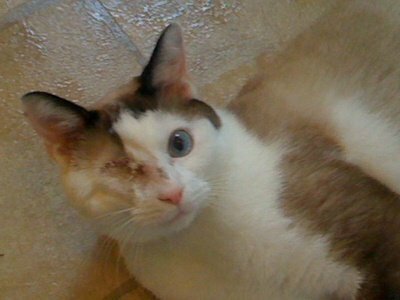 Thanks to Angela’s’ Angels, Gizmo survived a life-threatening eye infection and is available for adoption. We mainly focus on cats in high kill shelters, however we also take in strays and owner surrenders from time to time. Once we have resumed responsibility for a cat, we have them fully vetted, vaccinated and spayed/neutered. They are then placed in foster homes for a quarantine period (some longer, if needing socializing or needing to be an only pet). We are a no kill, cage-free organization and all cats can remain with us for the duration of their lives if they are not adopted. We do actively seek permanent homes for the cats we rescue. We rescued a litter of kittens from a high kill shelter in North Carolina. These kittens had, unbeknownst to us, Panleukopenia and we sadly lost three of the four. 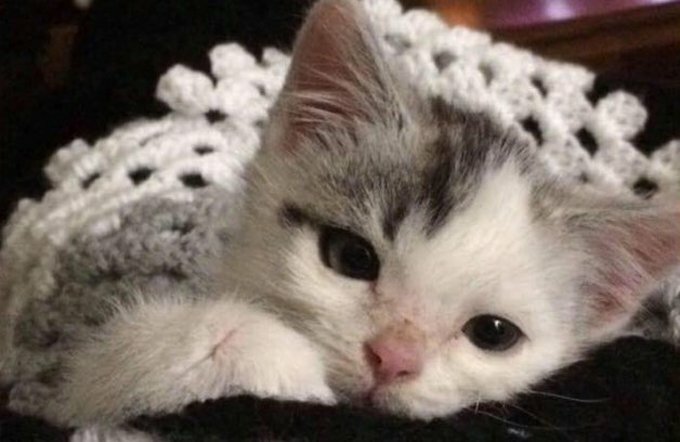 Sparkle, the surviving kitten, touched everyone with her courageous fight to live. She not only had the panleuk, she required round the clock care and weeks of medication: She had also been wounded (either at the shelter or prior to going to the shelter) and had abscesses form on her front paws going completely up her tiny chest, causing her fur to come off. She was in a great deal of pain and this too requires strong meds for fever and antibiotics for infection. The high fevers Sparkle experienced caused neurological problems as well as making her deaf. Despite all she went through, she remained a sweet, social, and affectionate kitten. She has been adopted and now lives in Virginia with two other special needs cats that have been adopted from us. Want to support Angela’s Angels great work? Check out their How You Can Help page, which provides information on adoption, volunteering, fostering, and donations. Also, be sure to like Angela’s Angels Facebook page to help share cats and kittens who need homes.